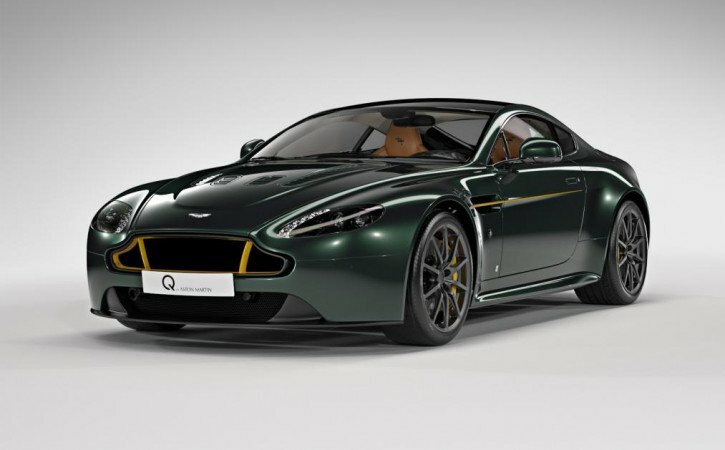 Aston Martin of Cambridge has launched a limited edition of the V12 Vantage S model. The special has been created to mark 80 years of the Spitfire fighter plane and will set buyers back £180,000. Only eight examples of this exclusive car will be made with first deliveries taking place on October 18th this year. Visually, the Spitfire 80 is finished in a special ‘Duxford Green’ colour with a yellow pinstripe running along the sides, a nod to the wing design of the famous single-seat fighter aircraft. Yellow detailing is also present on the grille and brake calipers, along with carbon fibre front and rear diffusers to complete the unique look. The aviation theme continues inside with Spitfire 80 logos embroidered onto the headrests and door pulls in red ‘webbing’, similar to that found in the aircraft. Buyers will also receive a number of accessories including a Irvin flying helmet and flying goggles for added retro appeal. No changes have been made under the bonnet meaning the usual 565bhp 6.0-litre V12 is present, capable of 0-62mph in a brisk 3.9 seconds and 205mph top speed. The eight Spitfire 80 models will be handed over to buyers at the famous IWM Duxford museum. The new owners will be treated to a day of activities including a Spitfire flight experience, armoured vehicle driving experience and a personal museum tour. The finale will be an opportunity to test the limits of their new cars along the runway, before watching a display of one of the last Mk1 Spitfires.